Distributed Greedy Coloring is an interesting and intuitive variation of the standard Coloring problem. It still consists in coloring in a distributed setting each node of a given graph in such a way that two adjacent nodes do not get the same color, but it adds a further constraint. Given an order among the colors, a coloring is said to be greedy if there does not exist a node for which its associated color can be replaced by a color of lower position in this order without violating the coloring property. We provide lower and upper bounds for this problem in Linial’s model and we relate them to other well-known problems, namely Coloring, Maximal Independent Set (MIS), and Largest First Coloring. Whereas the best known upper bound for Coloring, MIS, and Greedy Coloring are the same, we prove a lower bound which is strong in the sense that it now makes a difference between Greedy Coloring and MIS. 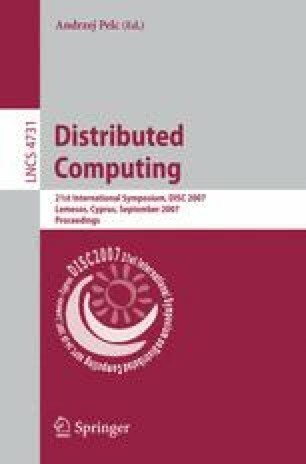 The research was partially funded by the European projects COST Action 293, “Graphs and Algorithms in Communication Networks” (GRAAL) and, COST Action 295, “Dynamic Communication Networks” (DYNAMO).